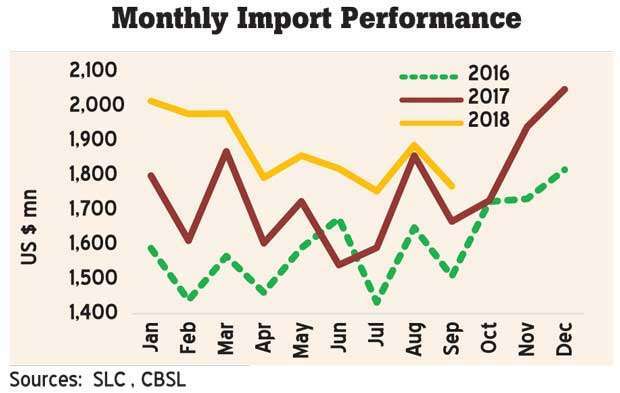 Vehicle imports by Sri Lankans shot up while the fuel bill rose sharply in the month of September, expanding Sri Lanka’s trade deficit, and pushing the island nation currently embroiled in a protracted political crisis closer to a full-blown external disaster. Sri Lanka’s trade deficit expanded to US $ 713 million in September from US $ 656 million in September last year, as the expenditure on imports outpaced export growth. The imports grew faster at 6.1 percent year-on-year (YoY) to US $ 1.8 billion, while the exports only grew 4.4 percent YoY to US $ 1.1 billion. The trade deficit for the first nine months of the year expanded to US $ 7.9 billion from US $ 6.8 billion recorded for the same period last year. Spending on personal vehicle imports soared 150 percent YoY to US $ 138.2 million in September mainly on cars with small cylinder capacity. The total expenditure on motor vehicles for the first nine months stood at a whopping US $ 1.2 billion, up 120 percent YoY. This was despite the higher tariffs imposed on August 1 and restrained financing conditions for personal vehicles in September. However, the Central Bank expects these measures to contain future vehicle imports. The country’s oil import bill rose by 33 percent YoY to US $ 396 million in September and 29 percent YoY to US $ 3.2 billion during the first nine months of the year. Meanwhile, the food and beverage imports sub-category under consumer goods fell by 31 percent YoY due to the demand killing domestic policies taming such imports while the rice harvest recovered amid favourable weather. 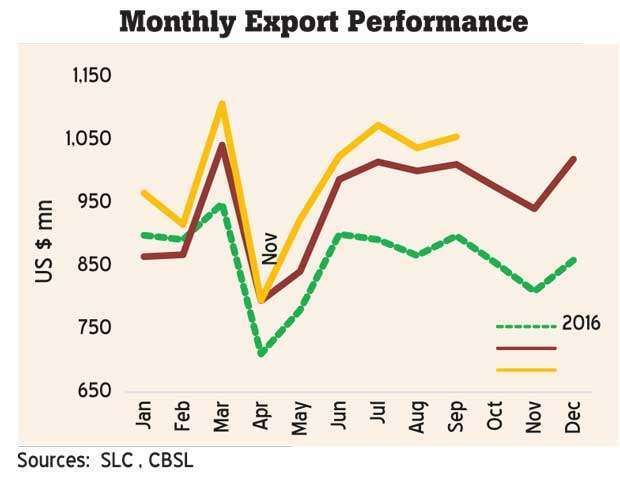 Industrial exports, which account for 77 percent of the total export earnings, grew by 9.4 percent YoY during September, while earnings from agricultural exports fell by 10.8 percent YoY, reflecting the poor performance in almost all categories except for seafood. Under industrial exports, textiles and garment exports rose by 10.4 percent YoY to US $ 476.2 million due to, “considerable high demand for garments from the USA and non-traditional markets such as Canada, India and Japan although a slight reduction was recorded in exports to the EU market,” the Central Bank said. Tea exports led the decline in overall agricultural exports as the prices reflected lower average export prices despite a marginal increase in export volumes. September tea exports fell 10.5 percent YoY to US $ 122.5 million, while export earnings for the nine months declined 4.1 percent YoY to US $ 1.1 billion. Further, earnings from coconut exports declined due to the reduction in coconut kernel products such as desiccated coconut and coconut oil while coconut non-kernel products showed a growth. However, earnings from seafood exports increased during the month due to higher exports to the EU market, the statement from the Central Bank said.